The holidays are right around the corner, and I have been thinking about what I am giving as gifts for several months. Yes, I definitely start early because there are some people on my holiday gift list that require a lot of brainstorming. Years ago, I resolved that gifts from me would be a meaningful experience. If I give a gift to someone, I want them to be able to use it, cherish it, or find joy in it. 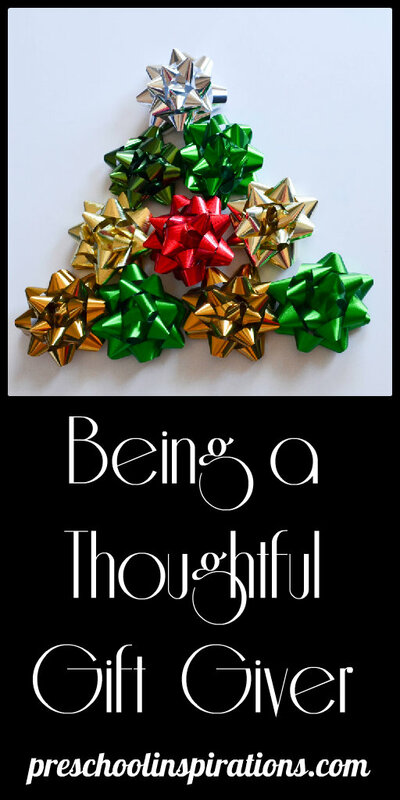 If you are trying to find “that perfect gift” for someone, I wanted to pass along my own strategies to help in the process to being a thoughtful gift giver. As exciting as gift giving is, it can also be stressful…very stressful if you have a tight budget! Please know that you don’t have to spend a lot of money to make something that is meaningful! In fact you can spend very little or almost no money and still make a huge impact. There are some very creative ways that you can give gifts on a tight budget. Consider your own strengths and talents to determine what a good fit would be. Are you an amazing cook or do you enjoy baking? I love yummy food, but I find cooking to be a chore…mostly because it can require a LOT of clean up! When people bless us with meals, or a delicious treat, it is so wonderful. Yummy goodies such as cake pops, cinnamon rolls, gourmet popcorn, or chocolate covered strawberries can be super pricey to buy, but they would be an affordable gift to make. If you enjoy sewing, you could make something personalized. Some of the most memorable items I have received were knit items such as scarves and blankets, a cross stitch keepsake, special outfits for my children, and even quilts. Perhaps you are very good with children or have lots of experience in this area. There are many parents or families out there who would love some complimentary babysitting! Is art one of your talents? Making something for someone’s home or office with some personalization is a gift most people would appreciate. Child made art is especially wonderful to those who love them. Do you have a nice garden or a green thumb? Homegrown vegetables and fruits are so delicious, and if you grow them yourself, they are a very affordable gift. If you have lots of nice plants and are good at multiplying them, you could buy a pot and pass one on for someone else to enjoy. Do you sell Mary Kay, Avon, Lemongrass, Thirty One, Origami Owl, etc? You could give products that you bought at wholesale as gifts, perhaps even items that you haven’t been able to sell, but would be a perfect fit for the person you have in mind. I get ALL of my makeup as a gift from my mom, and it’s so nice not to have to spend it out of my own monthly budget. Memberships can be a very thoughtful gift. I received one for my birthday for a hobby that I enjoy, and it has been so fun. I go every month, so it’s a gift that keeps on giving. Perhaps you can’t afford a yearly membership for someone, but you could pay an enrollment fee for the membership that they were already wanting. Are you really handy? There are a few items around my house that I would love to have fixed up or working properly. I would be ecstatic if someone worked on these for me as a gift. There are many people who have antique furniture that could use some tender loving care, or maybe it’s something as simple as having handles put into their kitchen cabinets! I think that if someone offered to mow our lawn in the summer time, my husband would be thrilled. You can add snow shoveling to his list too. Sometimes we can offer services as a gift. A friend of ours painted our living room as a gift (and even got us new curtains :)). He was just a thoughtful friend and knew that I hadn’t made the time to paint it, and since I was very pregnant, he and his family came over and blessed us in this way. We just might keep those colors in our living room forever. Maybe someone close to you has a physically demanding job. There are many professions that require lots of lifting or sitting in uncomfortable office chairs. A gift certificate for a massage might offer much needed relief that someone just hasn’t taken the time to do for him/herself. There are also the people who put so much love and nurturing into others and could use some pampering themselves. A gift certificate for services at a spa might be perfect, especially if they wouldn’t be willing to spend the money otherwise. Some of you might be wondering why on earth I would mention this because it seems so obvious. However, I feel that lots of times people do not put enough thought into this. Some of the suggestions I have mentioned above might be the worst idea for a gift for someone. Not everyone wants new handles on their cabinets, but there are definitely some of us that would LOVE it. This is key in finding the right gift. Of course we cannot read one another’s minds (while some people are better than others). So here is how I gauge what would be a good fit for someone. What is the person’s style? When you are in this person’s home, what do you see a lot of? Do they seem to be collecting something such as Willow Tree figures or Starbucks mugs. Is there a certain theme or vibe that is represented? Look for items to compliment what they already have going. I think a person’s house tells us a lot about what people like. Do you have someone in your family who is constantly wanting pictures of everyone? Photo gifts are perfect for this. I love making photo books for grandparents, and I have also made them for my preschool clients. I especially love surprising them with all the great pictures I have “kept secret” from them. If you go to the store with the person you are buying for, take close note to objects that they point out and “oooh” or “ahhhh” over. They will be flattered that you paid such close attention and remembered what they liked. What does your friend talk about on facebook? Whether it a sports team, a certain restaurant, or even their favorite sitcom. These can be helpful guides in finding a great gift. What are the person’s needs? I live in a city with lots of military families. Many of my friends don’t have family around, so I hear all the time about how they can’t wait for a date night. A great solution for people in this situation might be to make a date night package for them. They might love to receive a gift certificate for a date night out to dessert, whether it’s a specialty shop, frozen yogurt, or even a coffee shop. Some people are huge movie goers and would love that. If you have a larger budget, you could arrange special reservations at a nice restaurant for them. There will always be those people who are so hard to buy for because if they see something they like, they buy it. Their house is like a museum with collectibles and gadgets galore! They don’t need anything in the kitchen, any clothes, and they already purchased the newest and greatest piece of technology. They have three cases of their favorite wine already, and they own every DVD ever sold. So in these cases, I take them on an experience. Experiences are actually my preferred gift giving method, so I like to do these even for those who don’t have it all :). Experiences are simply just going out and doing something together. It does not involve any gift wrap, just good ole quality time. I love to take a close girlfriend out for painting and wine. This is a new trendy idea that seems to be popping up all over. It doesn’t matter if you’re not very artistic because you are there for the experience, or the leading artist will tell just to drink more wine. Perhaps there is a museum, aquarium, theatre, or nature center within a couple of hours from where you live. It’s so fun to surprise someone who loves that sort of thing and just hasn’t gone in a while (or doesn’t even realize that there is one). One of the best experiences I ever had was when one of my friends took me to a fashion show that featured a handful of designers from Project Runway. It was an unforgettable time. She knew that I loved Project Runway, and I would have never thought of it for myself. If you both enjoy nature and exercise, a great experience for you could be to go up a 14er together. Along the same lines, you could go skiing for a weekend. Simple experiences can be great too. A thoughtfully planned picnic at a nice park can be just the perfect event. Little stress and lots of fun. Sometimes just a nice dinner or lunch with someone is a wonderful experience gift. Life can be so busy, so it’s nice to slow down and enjoy. Some people are even able to offer an experience such as going on a vacation together. We are being blessed by some amazing family who are taking us to Disney World. I am so looking forward to the memories that we will create and remember. As you might have noticed, providing an experience gift does take planning and lots of thought. It’s not going to be something to plan for everyone, but it might be just what you need for that special person. Most of all I want to encourage you to find joy in giving. When we give from our hearts and give with thoughtfulness, that is what makes it truly special. I love to give thoughtful gifts as well, and it CAN be a lot of work and effort, but it’s also a huge part of the excitement and anticipation of Christmas for me -looking forward to giving meaningful gifts. Thanks for this list of ways to generate good ideas -very helpful! It sounds like you are an extra thoughtful gift giver, Maria! Isn’t it so great when we are as excited, or more excited, to give the gift. It’s a pleasure having you by!